More YouTube Brilliance & Inspiration! the ever wise Chief Seattle. we actually should be celebrating. that we all should know. I am no fan of the Columbus Day holiday that is still unfortunately observed in the U.S. My hope is that in time this day will instead honor the 2.5 million Native Americans or American Indians who are all who remain in the U.S. of the 50-100 million inhabitants of the Americas who were here when the European invasion and genocide began. And so today, on this Columbus Day, in recognition that he did not "discover" America, I choose to honor a some of the countless, little known innovations made by the wonderfully creative indigenous Americans that have ultimately benefitted the entire planet. Almanacs: Containing meteorological and astronomical information, these were invented by the Mayans around 3,500 years ago. Calendars: Developed throughout N. America, Mesoamerica, and S. America, used since 600 BCE. So precise that by the 5th century BCE they were only 19 minutes off! Chewing gum: Made from the spruce tree in New England. The Mayans were the first people to make it from latex gum. Long-fiber cotton: Its export helped to fuel much of the Industrial Revolution throughout the world. Embalming: Egyptians began their mummification around 2000 BCE, 3000 years after the Chinchoro of S. America began the practice. Approximately 60% of the food upon which the world’s population depends was developed centuries ago by American Indian agrarians who domesticated crops including: six species of maize/corn (150 varieties), five major species of beans, hundreds of varieties of potatoes, squash, zucchini, tomatoes, peppers, a range of nuts, avocado, wild rice, and more. Popular snack foods derived from American Indian agriculture include potato chips, french fries, and popcorn. Gold plating – The Moche (Peru) dissolved gold using an Alum/Saltpetre/Salt mixture which was then deposited onto copper vessels. The Incan highway system with roads and bridges all up and down South America and foot messengers who would have put the Greek marathon runners to shame. Medicines: Aztecs far surpassed simply knowing which bark made good aspirin or could be used to for quinine to treat malaria, or which berries treated scurvy. Using their sophisticated obsidian knives, Azteks knew how to perform a variety of surgeries, from the mundane to brain surgery. Anesthetics: American Indians used coca, peyote, datura and other plants for partial or total loss of sensation or consciousness during surgery, whereas non-Indian doctors didn’t have effective anesthetics until after the mid-19th century. Other medicines include Novacaine, syrup of ipecac, and astringents. Political theory: The Iroquois Confederacy of upstate New York represented a union of six tribes. Benjamin Franklin and other founding fathers borrowed heavily from the democratic Iroquois “federal system” of government when they planned the union that became the United States. The U.S. Constitution bears more resemblance to the model of the League of the Iroquois than the Greek Senate or English House of Lords. The whole idea of a balance of powers, of electing representatives, of governing by consensus all came from the Indians who were generally ruled, not by a “Big Chief,” but rather by a council of elders. Rubber products: Rubber balls, rubber balloons: The Olmec (Mexico) produced rubber balls by mixing rubber tree sap and latex around 1700 BCE. Along with the Maya, they discovered the process of vulcanization in waterproofing such items as capes, shoes, bottles, tarpaulins, ponchos, and baskets. Sports: Field and ice hockey and lacrosse (Canadian First Nations). Basketball was played by the Olmec over 3,000 years ago following their invention of the rubber ball. Sciences: The science of ecology as well as the American Indian belief system teaches that all life is interrelated and interdependent. This relationship is expressed in American Indian oral traditions and conservation practices. American Indian mathematic achievements include the development of highly accurate calendars and place value arithmetic. The Mayans of southern Mexico and Central America were the first people to use the concept of zero in mathematical calculations. Diapers, asphalt, megaphones, hair conditioner, hammocks, the spinning top, sunscreen, syringe needles, petroleum jelly, and freeze-drying foods such as meat jerky. Much is owed the the indigenous peoples of the Americas. –This includes acknowledgement of their immense creative and innovative genius. 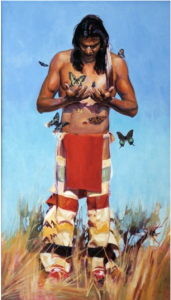 Speaking of which, I want to thank Northern Cheyenne artist Christopher Rowland for use of his wonderful paintings, titles listed in order, below. To see more of his work, go to http://www.facebook.com/media/set/set=a.56597471651.78999.570531651&type=3. "Gifts" 70"x40" oil on canvas (1991). "Little Man" 48"x36" oil on canvas (1997). Son of Scalp Cane, Northern Cheyenne. "Blessings" 28"x22" oil on canvas (2005). Buffalo Calf Trail Woman, a warrior woman of the Northern Cheyenne. I recently posted about the “Creative Geniuses” that are found throughout organizations. Again, each of us carries creativity within us. Some of us may need coaxing in order for our creativity to reemerge. For all, a certain amount of support and structures are needed in order for our ideas to manifest. Innovation Champions: They support innovation by helping creative people overcome the obstacles that otherwise inevitably impede their innovation efforts. Innovation Leaders: They define firms’ expectations and policies to favor innovation. Innovation champions “are usually persistent networkers… [who] know what’s going on many levels.” They know who has the skills, talents, and resources; who needs what; what’s not working, and what can be done to move the process forward. Mavens who have deep knowledge that they are keen to share. Salesmen who like to influence others to take action. Connectors who have strong relationships with many people. My undergraduate degree was in theater (Go, University of Detroit!). As one whose right brain is well developed and who naturally thinks in terms of connections and similarities, I'll share how I see the roles of champions and leaders in terms of the parts they would play in artistic productions, as in theater or film. I envision the role of champions as similar to that of theater or film directors. Collaboratively honing the production vision, they take the various tools and perimeters; the scripts and story-lines; the stage/sets, budgets, and timelines given to them by the producers; the talents, experience, strengths, weaknesses, and personalities of the actors, design and crews — and they orchestrate all of these. Sometimes, depending on the size and budget of the production, the role of director is shared and divided among various people who serve as executive director, art director, assistant director, etc. Similarly, there is (or should be) more than one champion within an organization. Champions and directors work with "the talent" to create a shared, organic vision and then to manifest it. While keeping their focus on the progress of the various production teams, they also work closely with the individuals. They coach the actors to explore and hone their roles and to interact in the most effective ways with the other cast members. They work similarly with the design and set crews. Key to the success of many directors is that they develop trusting relationships with the various individual artists in order to bring out the best in their talents, while building the collaboration and high trust that is needed for great ensemble productions and (what is called in the non-theater world) high-functioning teams. Do budgets include a line item such as “investment in innovation”? Are there seed funds to invest in promising new ideas, or teams of people to manage ideas that do not fit inside existing business units? — If not, then innovation isn’t likely to happen. Hat’s off to those Champions and Leaders who orchestrate creative genius and make the great innovations that move us all forward possible! And for his white paper: "Creating the Innovative Culture: Geniuses, Champions, & Leaders"